Your pictures came out great!!! Gorgeous. The weather looks mighty nice there. It's kind of drizzly there, I am so envious. Loving the different shots! What a peaceful look, but also know how much merriement goes on there. Have a great day and great photos. Great photos! I love all the clean lines and angles. Isn't it just amazing where we can find beauty in our world?!?! Wonderful photos, Betty!! You've brightened my day! A track that has no one on it, that in itself is amazing! Great photos! 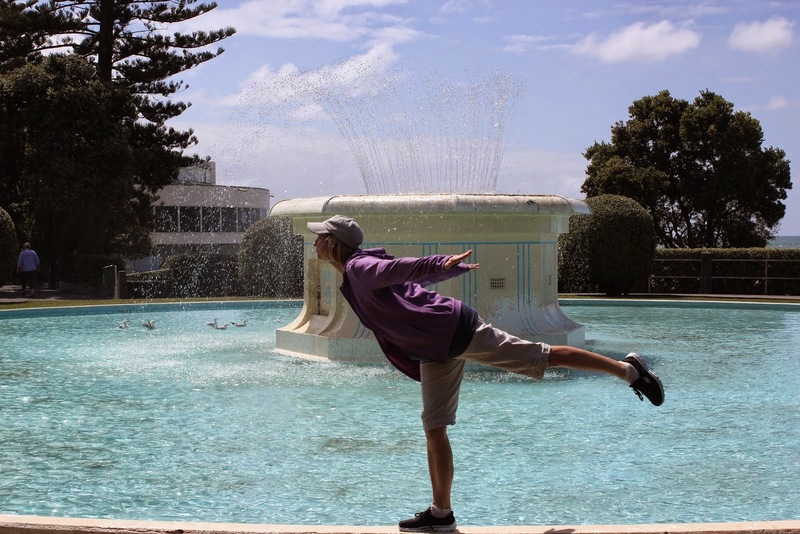 i adore your writing, but you could become a photo blog! The second one is my favorite. Looks like benches in the sky. Those are such cool shots. Looks metallic, I love your shots, Betty. These pictures are spectacular! Such great contrast and lines. And the blue sky. Love them! Wonderful photos!!!!! 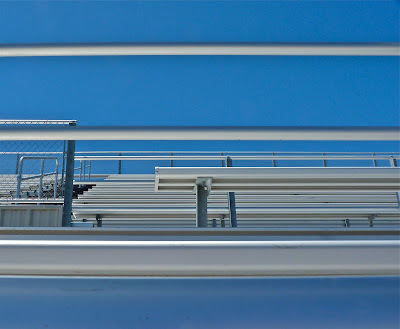 It is hard to capture, with any clarity, stadium bleachers. You did a great job! What a clean, beautiful stadium. Your pictures always come out so great. It is too hot around here to go out and take pictures now. LOVE it, love your themes!! Although, being the enormous football (Cleveland Browns!) 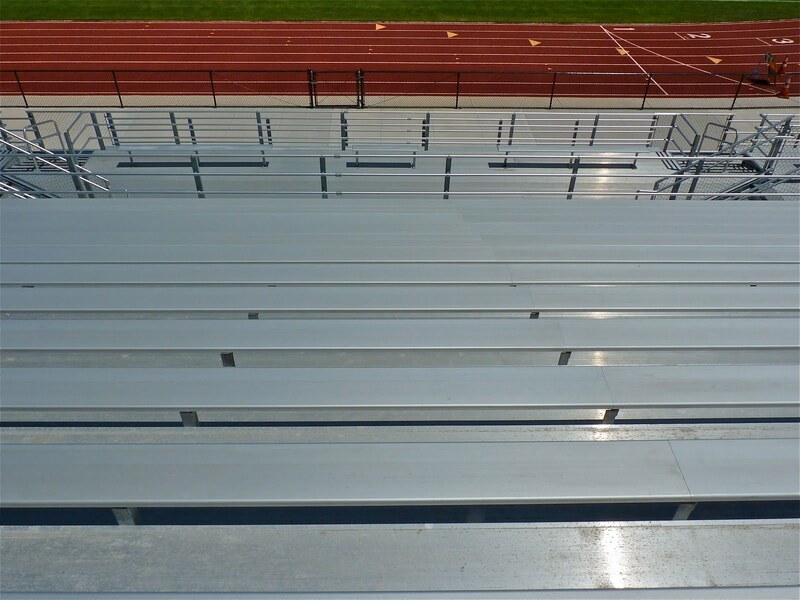 fan that I am, I can't wait until stadiums like these are filled with rowdy fans in the Fall!! It's so cool looking at the world from your viewpoint, Betty. These are really great pictures. The stadium is portrayed quite differently here when it is empty and no one is around as compared to how you usually think of it--full of people, crowded and noisy. Silent and really damn clean! 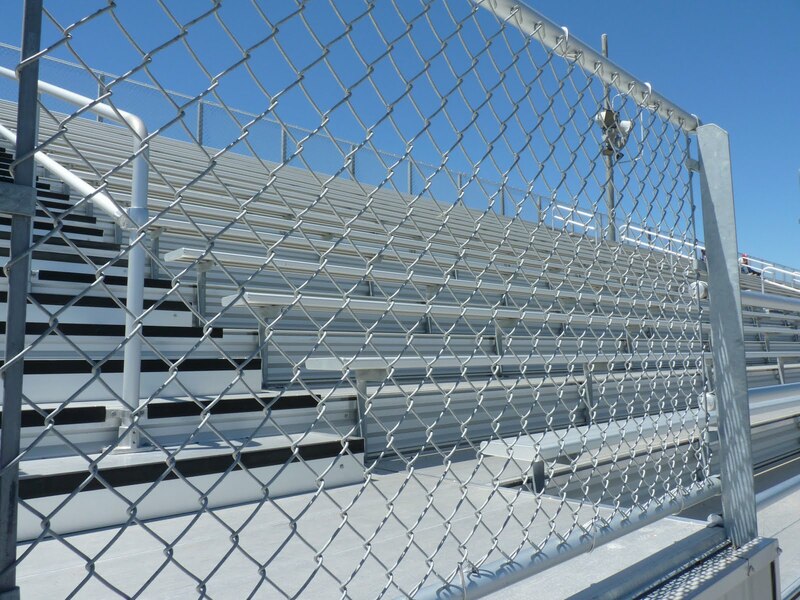 Those are the cleanest bleachers I have ever seen. 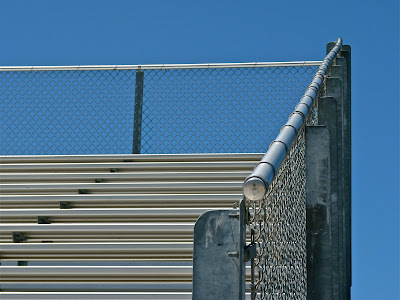 I like the light bouncing off the bleachers... BUT these images kind of upset me. When I was a kid watching track and field at our local stadium, I always imagined myself or someone else tumbling down the bleachers. 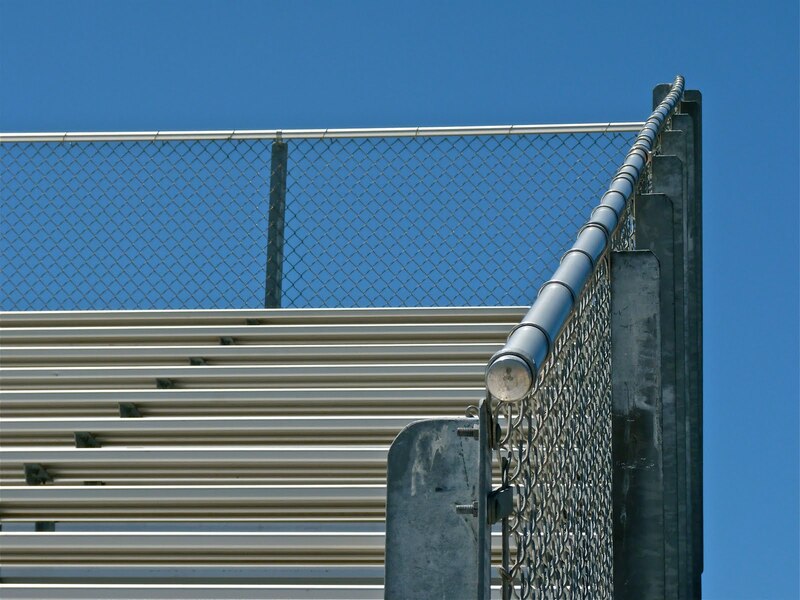 You know how some people don't walk down on the steps, but on the actually bleachers? AAAAH! whenever i see bleachers i think of like rocky or some movie where people are running up and down training. weird, i know. i also think of ny yankees bleacher creepers as they call them here. but the images are really cool the way you captured them! What a great angle on all of these photos. You have an artistic eye. BB what a unique silver post!! You are quite creative. Thank you for you kind words on our blog today. We are having fun, as my hubby says, on our Steeple Chase. Wow - I love how they are cold and impersonal against the other colours. Perfect captured pics of symmetry and form. Lovely! The silver against the blue sky - looks fantastic. Oh, now I don't know how to think of you: a writer? a photoer? Either way, you are excellent at both. Excellent. Great angles and lines in these shots! Your photography Betty is poetry for the eyes. There is something so eerily cool about an empty stadium, no matter the size. Love these pictures. What a peaceful day you had..Great shots as usual. 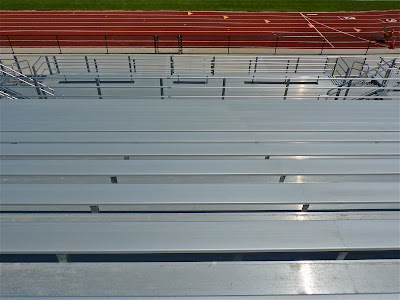 Who would ever know that half the time these bleachers are filled with noisy happy fans. 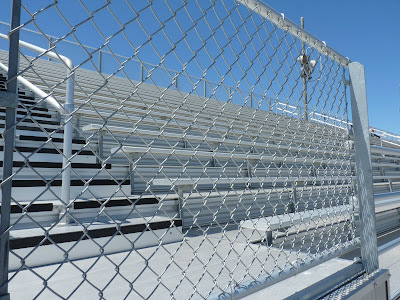 Throws a whole new perspective on the bleachers, a peaceful one at that. Kind of sad to see an empty stadium with no cheering fans. It is almost eerie. Nice shots! Are you here in Oz? I actually have a small one in my frontyard. love them. You really make me want to get a new camera! Oh cool, this post was truly an experience. You really brought a little welcome stillness into my day. Lines, perspective, shadows and curves. You've found it all. Great shots. Who knew an empty stadium could look so cool? 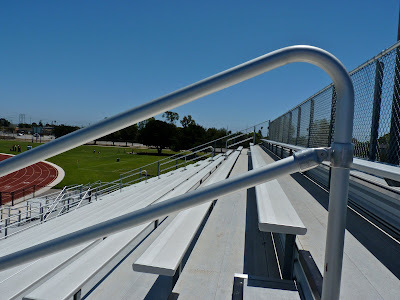 I see those bleachers and remember having to climb them over and over again for gym class. 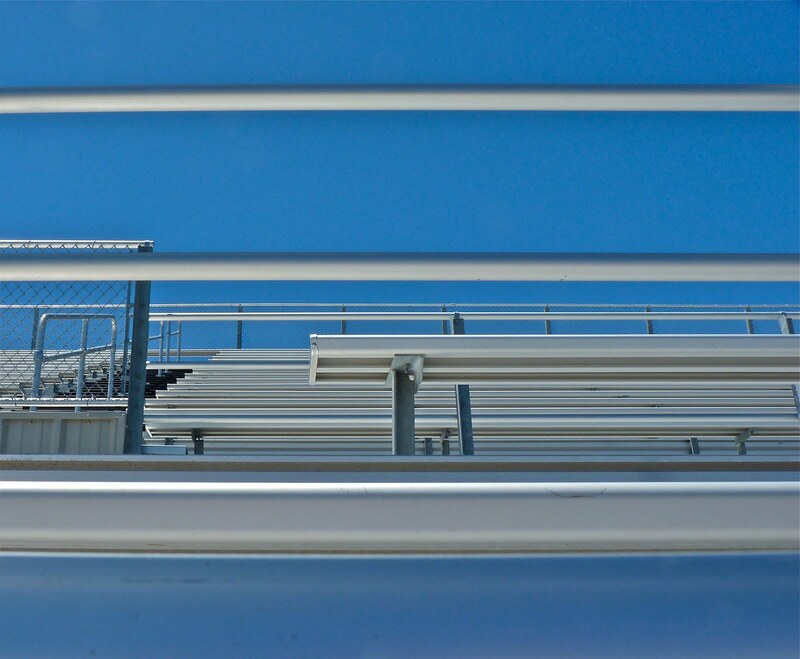 Who woulda thunk you could do so much with stadium bleachers...great photos. Great photos. I like the angles and perspectives. Too bad this game didn't bring in a single fan, though. I'm guessing it wasn't the World Cup. ooh, this makes me want to dust off my nikon. beautiful shots - love the sense of linear symmetry. You take the most amazing shots! Those shots make me think, "the calm before the storm..."
What... no litter? Sure wouldn't look like that around here. That last picture makes me think of the movie "Grease". "Tell me more, tell me more, did you get very far"
How blue is that sky! Wow! Now I feel better. 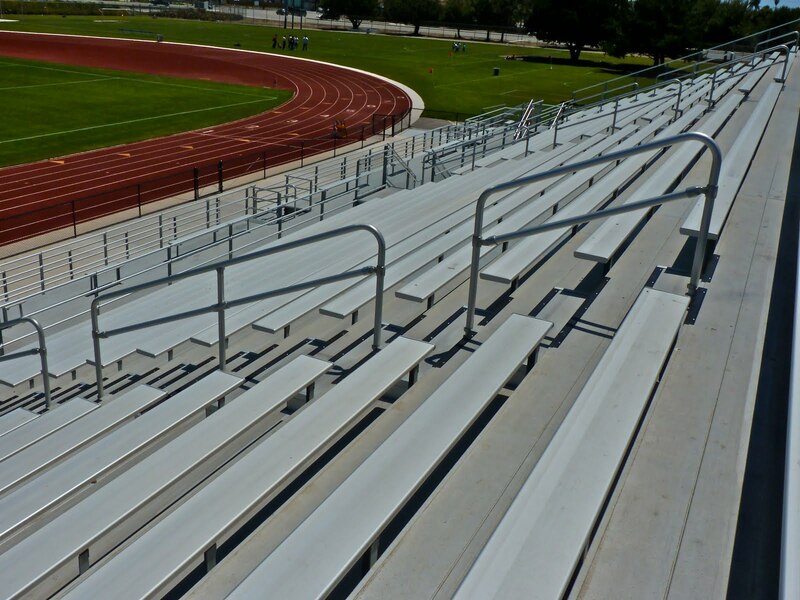 I thought I was the only one who took pictures of empty stadium seats. Whew! I feel much better now. Great pics, by the way! I love the second and the last one in particular. The blue is out of this world! Pretty. Looks like a gorgeous day. The Newspaper: Either You Get It or You Don't. Monday Morning Flowers With Fishy Bonus Too! Betty and HOB Go Hiking At the Pinnacles. The Long and Short Goodbye. Betty JABS Her Followers With Love and Gratitude! Single File, People. Single File.